Technically this is both an iOS and Mac OS X application. What it does is let you use your iPad as a second monitor with your Mac. When I am using my Mac my iPad isn't usually in use (unless a family member stole it) so I use Air Display to make it useful while I am using my Mac. You get a 1024x768 or 768x1024 display that rotates and flips automatically - like you would expect. The Mac portion is free, but you buy the iPad App. Runs with Windows too. Operates over WiFi, but you can always create a private network if one does not exist or it is too slow! OmniDiskSweeper scans your hard drive telling you where your largest files are, making it easy to delete cruft. It's intelligent in how it presents this information hierarchically. It's one of my top 5 favorite apps and one I'd hate to do without. I use it every time I start a new project! SABnzbd is an Open Source Binary Newsreader written in Python. It's totally free, incredibly easy to use, and works practically everywhere. SABnzbd makes Usenet as simple and streamlined as possible by automating everything we can. All you have to do is add an .nzb. SABnzbd takes over from there, where it will be automatically downloaded, verified, repaired, extracted and filed away with zero human interaction. iChm is an ebook reader for CHM (Microsoft Compiled HTML Help) files. An open source project that is slowly replacing TextMate for me. Designed for scientists, Papers manages PDFs of journal articles. Articles imported to Papers can easily have their metadata applied from journal databases. Articles can then easily be sorted by author or journal, and labeled with different categories. Papers has an associated iOS app that it syncs with. Available in 23 languages : American & British English, French, German, Spanish, Czech, Simplified & Traditional Chinese, Polish, Hungarian, Russian, Slovenian, Romanian, Italian, Korean, Brazilian Portuguese, Dutch, Slovak, Japanese, Swedish, Danish, Ukrainian and Arabic. A Finder replacement. Two panes file management program. Not as cutomizable as Total Commander but has a lot of features builtin. Plex has all but replaced VLC as my primary media application. If you're finding your laptop screen too bright at night even on the minimum brightness, Shady's the right guy for you. Basically, it puts a transparent overlay over your entire screen, dimming it anywhere between 0% and 90% of normal. The absolute KING of creative tools. Sure, the price is a bit up there, although there really isn't anything that can touch the versatility of having seventeen applications at your disposal. I've used some of these tools since their very existence (Illustrator, Photoshop) and I honestly can't imagine working without them. It would be difficult to describe what they all do; infinite possibilities. ◆ I'm a bit shocked this is just now making it's debut here. An amazing calculator that does it all with a nice text-based interface. Hiss is an OSX app that forwards notifications from Growl enabled apps to Notification Center in Mountain Lion. Currently in beta, but it does an awesome job of piping all your Growl notifications into the Notification Center of OS X Mountain Lion. The only real downside to it is that it flags all notifications with the Growl icon. KeePassX is a cross platform secure password saver. Like Keychain, but you can use it on your mobile phone and windows computers. Audio Hijack allows you to record any sound from your Mac or input device. You can also mute certain applications. This is my go-to-application for any audio recording. It's Apple's program for taking notes. Very minimalistic and fast. VoodooPad is a place to write down your notes and thoughts. Ideas, images, lists, passwords, your mom's apple pie recipe. Anything you need to keep track of and organize. VoodooPad will grow with you without getting in the way. 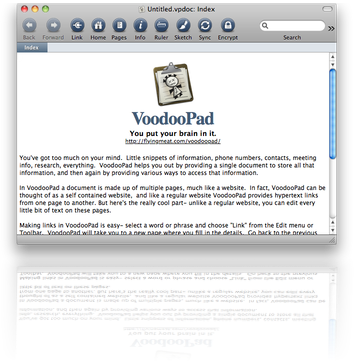 Drag and drop folders, PDFs, applications, or URLs into VoodooPad, and they will link up just like on the web. And with powerful search, nothing will be lost or out of reach. Disables sleep mode, so you can shut your lid without the system hibernating. An application launcher, like Quicksilver. Having tried both, I found Quick Search Box's UI to be cleaner and the overall application to be faster. This is an awesome calculator that I have been using for at least 10 years. For basic arithmetic and quick calculations this app can't be beat. It is also available from the Mac App store. Fraise is a free text editor for Mac OS X Leopard 10.6 which is both easy to use and powerful. It is designed to neither confuse newcomers nor disappoint advanced users. General-purpose text editor with extensive syntax highlighting support. Can be downloaded via MacUpdate. a free, native OS X hex editor based on the Cocoa framework. Unlimited file size (limited by what the actual file system supports). Instant opening of files of any size. Plug-in system to display your custom data types. For all those low-light situations, Nocturne is a tool for inverting colors, changing screen tint etc. So I can make the screen dimmer while keeping it readable, when the dimmest backlight setting is too bright. I especially like the Invert hue option, which can be used to keep colors the same while inverting black/white. Overflow is an application designed to quickly launch applications, open documents, or access folders while reducing the number of items needed in your Dock. Base is an awesome tool for managing SQLite databases. It has an intuitive interface and allows you to easily create or alter tables. I especially like that the transcript shows you exactly what queries Base is executing against your database. A simple yet powerful clipboard management tool.